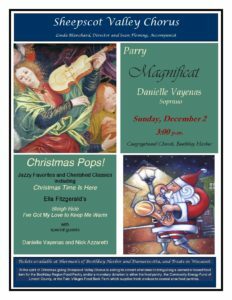 Notes: Sheepscot Valley Chorus celebrates its 38th season with a “Christmas Pops!” concert on Sunday, December 2, at 3:00 p.m., at Boothbay Harbor Congregational Church. 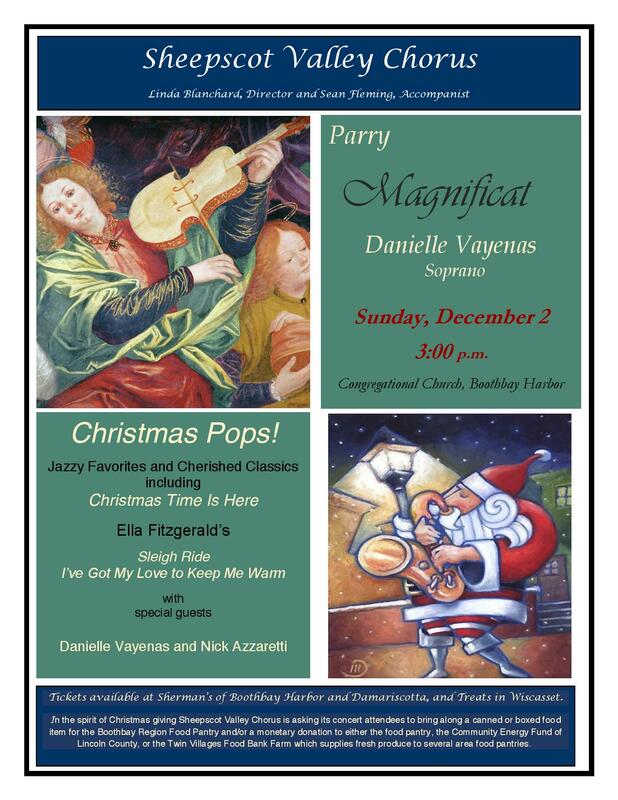 The featured work for the concert is Hubert Parry’s great Magnificat setting, the Magnificat in F. Led by artistic director Linda Blanchard and accompanist Sean Fleming, the concert will also feature several jazzy arrangements of hit tunes such as “I’ve Got My Love to Keep Me Warm,” “Sleigh Ride,” “Little Jack Frost Get Lost,” “Here Comes Santa Claus,” and more! The vocal talents of soprano Danielle Vayenas and bass Nick Azzaretti will be featured in solos and duets, along with multi-instrumentalist Marcus Hutchins. Written in 1897 and dedicated to Queen Victoria on her Diamond Jubilee, Parry’s Magnificat in F is in five sections with an emphasis on counterpoint, as well as other Baroque devices, and takes its cue from J.S. Bach’s Magnificat (BWV 243). This is quite apparent in the exultant opening, while the third part, “Et misericordia,” is a choral meditation with a moving obbligato, and one of Parry’s loveliest moments. The finale ends with an exciting fugue. Some familiar and not-so-familiar arrangements of Christmas songs will be sung, including a jazz-choir style version of “Have Yourself a Merry Little Christmas,” the Vince Guaraldi favorite “Christmas Time Is Here,” and a fun women-only arrangement of “Here Comes Santa Claus” based on the popular Glee version. In the spirit of Christmas giving Sheepscot Chorus asks concert attendees to bring a canned or boxed food item for the Boothbay Region Food Pantry and/or a monetary donation to either the food pantry, the Community Energy Fund of Lincoln Country, or the Twin Villages Food Bank Farm. Tickets are $15 for adults and free for students, and may be purchased at Sherman’s Bookstore of Boothbay Harbor and Damariscotta, Treats in Wiscasset, and at the door. For more information, please visit our website at sheepscotvalleychorus.org.